Centrally and strategically located near Memphis, Tennessee, America’s Distribution Center, and home of the FedEx World Hub. Tennessee-based U.S. Aerospace Corp. (USA) is centrally and strategically located near Memphis, “America’s Distribution Center,” and only a short distance from Nashville. The Company’s close proximity to Memphis, home of the FedEx World Hub, enables USA to drop off mission critical domestic and international shipments as late as 11:00 p.m., Monday through Friday. While we are proud to be a neighbor of FedEx, we also utilize other major air freight companies and commercial airlines, including UPS, Airborne Express, DHL, American Airlines, Delta and others. 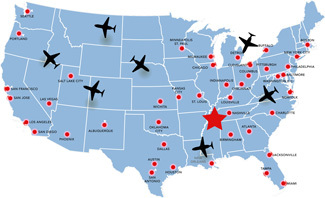 Our convenient access to Memphis International Airport and Nashville International Airport also enables USA to provide numerous options for 24/7 counter-to-counter delivery and receipt of time-sensitive shipments. USA’s central location helps to facilitate the efficient delivery of outbound shipments to aviation customers and the receipt of inbound shipment of parts and components from the many worldwide customers, who take advantage of USA’s advanced aircraft maintenance, repair and overhaul capabilities.